Today’s Reveal Answer: Check Please! 56A. Words to a server … or a hint to the first words of the answers to starred clues : CHECK PLEASE! Act II is a brand of popcorn that is marketed as having a taste and appearance that is similar to popcorn that we can buy at movie theaters. 16. Corrida cheer : OLE! Spanish bullfighting is known locally as “corrida de toros”, or literally “race of bulls”. Ali Velshi is a television journalist from Canada who joined MSNBC in 2016, after having worked with CNN and Al Jazeera America. The constellation named Ursa Major (Latin for “Larger Bear”) is often just called the Big Dipper because of its resemblance to a ladle or dipper. Ursa Major also resembles a plow, and that’s what we usually call the same constellation back in Ireland, the “plough”. There are a couple of letters G (gees) in the word “gags”. In Old French, a “naperon” was “small table-cloth”. The term was absorbed into English as “napron”, describing a cloth used to cover the front of a person at work. Over time, “a napron” was heard as “an apron”, giving us our contemporary noun “apron”. Roger Federer is a Swiss tennis player considered by many to be the greatest tennis player of all time. Federer is married to former tennis pro Mirka Vavrinec. The couple are parents to two sets of twins. “To louse up” is a slang verb phrase meaning “to spoil, botch”. 2010’s “The Book of Eli” is one of those “end of the world” movies, with Denzel Washington playing a tough guy traveling across what is left of the United States after some apocryphal event. “Usury” was originally the name given to the practice of simply lending money at interest, but the term now refers to lending at rates of interest that are excessive. John Muir was a famous American naturalist, although he was born in Scotland. Muir founded the Sierra Club in 1892. He published “My First Summer in the Sierra” in 1911, which described one of Muir’s favorite places in the country, the Sierra Nevada range in California. Our verb “to spruce up” means “to make trim or neat”. The term comes from the adjective “spruce”, meaning “smart, neat”. In turn, the adjective comes from “spruce leather”, which was a Prussian leather that was used in England in the 15th and 16th centuries to make a popular style of jerkin that was widely considered to look quite smart. Pewter is a relatively soft alloy that is made up mostly of tin, with some copper, antimony, bismuth and lead. The celebrated American writer Edgar Allan Poe was born “Edgar Poe” in 1809 in Boston. Poe’s father abandoned Edgar and his two siblings after the death of their mother. As a result, Edgar was taken into the home of the Allan family in Richmond Virginia. His foster parents gave the future author the name “Edgar Allan Poe”. Our word “ajar” is thought to come from Scottish dialect, in which “a char” means “slightly open”. The athletic teams of the University of Alabama (“Bama”) are nicknamed the Crimson Tide, a reference to the team colors of crimson and white. Duke Ellington was a bandleader and composer believed by many to have elevated jazz to the same level as other respected genres of music. Ellington tended not to use the word “jazz” to describe his compositions, preferring the term “American Music”. It is believed that our word “barbecue” (BBQ) comes from the Taíno people of the Caribbean in whose language “barbacoa” means “sacred fire pit”. The distance around a newer running track is 400 meters, as measured in the inside lane. Tracks used to be 440 yards around, so that four laps added up to an even mile (1,760 yards). As race distances changed to meters, the mile race was dropped in favor of the “metric mile”, 1600 meters, which is equivalent to 1,750 yards or 0.994 miles. The dromedary, also known as the Arabian Camel or Indian Camel, is the camel that has only one hump. The other species of camel is the Bactrian, which has two humps. The hump of a dromedary contains up to 80 pounds of fat, which can be broken down into water and energy if no food or water is available. Ocala National Forest is a large protected area covering over 600 square miles of Central Florida. Included in the bounds of the forest is the US Navy’s Pinecastle Bombing Range. Navy planes drop about 20,000 bombs annually at Pinecastle, although only a few hundred are live munitions. Alkyd paints are also known as “oil-based” paints. They are an alternative to “latex-based” paints. “Feud” is a TV series that dramatizes actual events in celebrity feuds. The first season debuted in 2017 and explored the rivalry of Hollywood superstars Bette Davis and Joan Crawford (portrayed by Susan Sarandon and Jessica Lange). A second season takes on the relationship between Charles and Diana, the Prince and Princess of Wales. The actor Esai Morales is best known in the world of film for the 1987 movie “La Bamba”, which depicted the life of Ritchie Valens and his half-brother Bob Morales (played by Esai). On the small screen, Morales plays Lt. Tony Rodriguez on “NYPD Blue” and Joseph Adama on “Caprica”. The Home Shopping Network (HSN) was the first national shopping network, and was launched locally as the Home Shopping Club in Florida in 1982. The QVC shopping channel was founded in 1986 in West Chester, Pennsylvania. The company now has operations not only in the US but also in the UK, Germany, Japan and Italy. That means QVC is reaching 200 million households. The QVC initialism stands for Quality, Value and Convenience. 56. 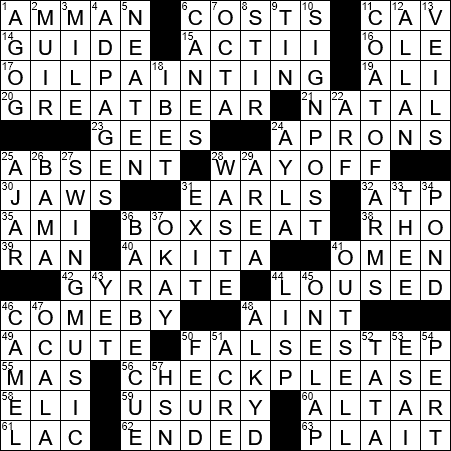 Words to a server … or a hint to the first words of the answers to starred clues : CHECK PLEASE!